Tyres were very slow to show up in the Meccano system, despite many requests through the Meccano Magazine. In March 1921 they were "not thought fit to include in our system". In April 1924, part 142, the Rubber Ring (Chassis Tyre) was quietly included under "New Meccano Parts". Four of these were introduced into outfit 7 in 1926 (intended for the Meccano Motor Chassis) with the "New Meccano", reducing to three in 1928 (as the outfit 7 by then included the new Motor Tyres). These three were really only included in order to build the Motorcycle and Sidecar, Supermodel 3. They continued into the outfit L but did not appear in the new numbered outfits from 1937. Along with many other pre-war parts the rubber rings remained on the illustrated parts listings right through to 1952, but weren't on post-war price lists. They were effectively discontinued at the end of 1941. Finally, in February 1927, the Meccano Magazine introduced the 3" and 2" rubber tyres, manufactured in conjunction with Dunlop in a unique collaboration. The 3" tyres were introduced to the outfit 7 in 1927, and the 2" tyres in outfit 4 and larger from 1930. Post-war outfits have four 2" tyres in outfits 8 and above, but the 3" tyres are only supplied in outfit 10. 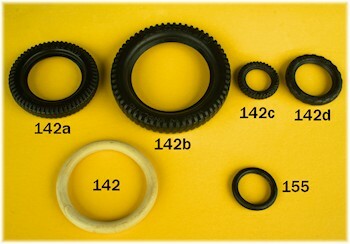 In May 1928, the new part 155 Small Rubber Ring was introduced. This was described as "primarily for use in frictional driving mechanism and ... in Meccano clutches, etc". It was called for in the Supermodel 1 "New Meccano Motor Chassis" leaflet in the clutch, as shown in the diagram to the right. It could also (according to the Meccano Magazine) be fitted to a 1" pulley wheel as a tyre. This part is not included in the photo above. One was included in outfit 7 from 1928, increasing to two in 1930 and on to the L outfit. They are therefore quite rare, and also suffer the indignity of being inadvertently thrown out as they don't look much like a Meccano part. 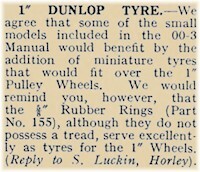 In the usual way, Meccano tyres for 1½" pulleys were considered "unnecessary" in February 1928, but announced as "now available" in November 1929, along with the 1" tyre. Finally, all four Motor Tyres were available as in the top picture. These smaller tyres, however, didn't appear in any outfits until the inclusion of four 1" tyres in most outfits from 1951. The 1½" tyre was never included in any outfit, and so continues to be much rarer than the others. In 1937, the new part 155a in white was introduced, fitting a 1" pulley properly, and included with all outfits. 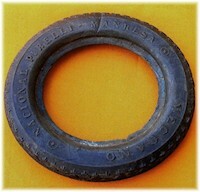 This rubber ring was significantly larger and thinner than the earlier part 155, and looks like the post-war part 155 shown in the photograph above, but in white rubber. Post-war, part 155a was dropped and replaced by the black version of the same thing shown above, now taking over the number 155. 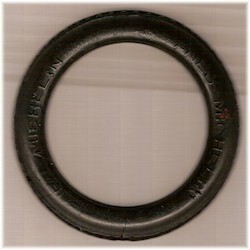 The rubber ring was manufactured from white rubber; it is now usually found somewhere between off-white and brown, and rarely with any flexibility. There don't appear to have been any variations between its introduction in 1924 and its demise pre-war. The first tyres are easy to identify, as they are clearly marked DUNLOP CORD on the sidewalls. 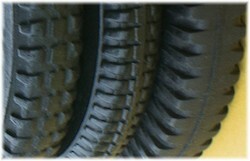 The tread consists of three rows of roughly square knobbles, the centre row of which are connected by a fine line of rubber. This is clearly shown on the pictures in the February 1927 Meccano Magazine introduction. Mick Burgess has kindly provided pictures of what is obviously the first type of tyre, as it matches perfectly the image in the Meccano Magazine. These tyres show the text in a large, wide, sans-serif font unlike anything previously used by Meccano. They also don't show the word MECCANO although they do (like all other tyres of this era) include Made in England in small letters. These tyres appear to be very rare, does anyone else have some? They are effectively a Dunlop product sold by Meccano, rather than a Meccano part. The next version includes the word MECCANO and moves to the standard Meccano serif font. I believe that there are two distinct versions of this tyre, distinguishable in that the Meccano Dunlop Cord text is much finer on one than the other. The photo to the right shows a (probably earlier) high quality moulding at the top and a lower quality chunkier version below. I don't believe that this is a mould or age artefact. If you look at the O in CORD, it is noticeably different in style and the contrast between thick and thin is much greater than in the lower example. We don't have dates, obviously, but these can be identified individually once you know what you're looking for, which is the key element in these things. The next version is identical, but is missing the word CORD. Thus the tyres show only MECCANO DUNLOP around the sides. We are not sure when this change happened, but it is likely to be somewhere around 1930. The previous varieties are too common for it to be much earlier than this. 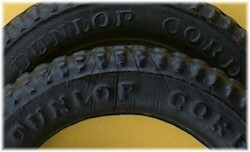 There is a US-manufactured version of this tyre, easily identified by the stamping DUNLOP BALLOON around the edge. The tread is also significantly different, being diagonally cut. This is likely to be late 1920s as well, when A.C.Gilbert was still manufacturing Meccano parts. Since it's a US-made part only, we shall consider it a variation for the moment. This is a shame, as the tread is much more realistic on this tyre than any of the others. The third variety has the tread change to a much finer style, with the three previously distinct rows almost blending into each other as a strap across the tyre with a small gap between them. The wording around the sides of the tyre remains as DUNLOP MECCANO. Again, the exact date is unknown, but these tyres are seen in late pre-war outfits so it must be some time in the mid-1930s. These fine-tread 3" Meccano Dunlop tyres appear in the very first outfits 9A and 10 post-war, in 1950-51. Post-war tyres change their tread style again, and most importantly lose the Dunlop reference, now stamped only MECCANO (along with Made in England). The tyre now has a much squarer profile, with regular straps across the tyre. The separation into three lines disappears, and the tyres appear as in the top picture on this page. The 2" tyres part 142a appear in this new style by 1950 or earlier, but as stated above the 3" tyres part 142b are still supplied in the old style for a couple of years. This is probably just using up old stock. These tyres aren't common, however, having been supplied only in outfits 8 (for the 2") and 10 (for the 3"). There was a very short production run of these before the tyres changed colour to a light grey around 1954 or so. The light grey tyres are by far the most common variety, lasting right through the rest of the 1950s and 1960s. At some point early in the 1970s, the tyres changed to a black neoprene. These tyres are much more practical as they don't suffer from hardening in the same way as the older rubber ones. They are easily identifiable as they are quite shiny. By 1975 at the latest all outfits 9 and 10 had these black neoprene tyres. The only exception to this set of parts is the 1½" tyre, part 142d. For some reason, the tread on this tyre changed significantly to a much chunkier tread pattern, but quite subtle. It is extremely difficult to date this change, as the tyre was never supplied in any outfits. John Nuttall has spotted a set in the May 1955 Meccano Magazine, showing that they must be before this point. So presumably they are in from between the last Dunlop style and the square profile tyres. They are very common though, which makes it difficult to work out how this pattern developed. Perhaps a large number were manufactured, and then remained in the shops for a very long time. After the demise of Binns Road, the tyres continued to be manufactured by the French factory and supplied in the "Enthusiaste" outfits up to the end of 1992. These tyres are of the latest style, but are made in a soft matt black rubber (not neoprene). They are stamped MECCANO - Fab en France. There is then a truly terrifying array of special tyres that were released from 1980 to the present day. It might even be beyond the range of this website to identify them all, but then with all the help available maybe we could. 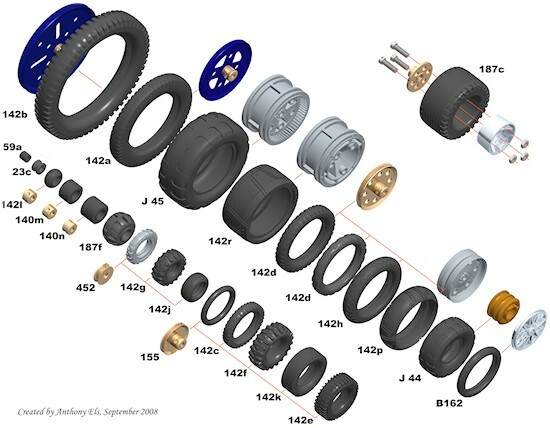 To give you an idea of the problem, here is a CAD drawing of a small range of the later tyres. This image kindly supplied by Anthony Els. The first part 155 was a small fat ring, described as being 5/8" diameter. This is an unusual part, not originally intended as a tyre. It was designed for the clutch in the Supermodel 1 "Meccano Motor Chassis". We can see from the Meccano Magazine April 1929 entry shown right that the ring was suggested for use as a tyre, until November 1929 when the Dunlop 1" tyres were introduced. No variations on this part are known. The examples identified so far have an inside diameter of around half an inch or slightly more, and an outside diameter of slightly less than an inch (0.9" or around 7/8"). They are considerably smaller and fatter than the later versions. The small fat version of 155 continued on, being supplied only in outfit 7 and outfit L, until it was joined in 1937 by the larger 1" thin white rubber ring part 155a. These were obviously intended as tyres, as four were included in all outfits except outfit 0. They sadly don't survive well. Post-war, part 155a was discontinued and part 155 became an identical but thin black rubber ring. The old fat rubber ring designed as a clutch was replaced by this new thinner version. Part 155 was made from black shiny neoprene from the mid-1970s, along with the other tyres. The original blueprint for this part can be seen by clicking here. Much less well-known is this very unusual Spanish Meccano tyre, marked Nacional Pirelli - Manresa. Manresa is a town in Catalonia, Spain (near Barcelona) where the Pirelli factory was. There is a history of special Meccano parts being resurrected by the Spanish Meccano factory (such as the loom parts), and this looks like another one. Mick provides us with another special, a French manufactured tyre marked PNEU MICHELIN twice and (smaller) FABRIQUE EN FRANCE. This could easily have been a French version of the first tyres, manufactured this time by Michelin. Did Meccano do separate identical deals with Michelin and Pirelli for different countries? 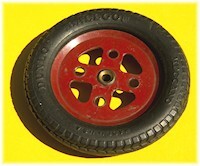 Note that this tyre is not marked Meccano, but then neither were the first UK versions. It might possibly not be Meccano, but it seems likely. Black rubber ring, 5/8'' diam. White rubber ring, 1'' diam. Black rubber ring, 1'' diam. Total number of messages on this page: 22. This is page 1 of 4. It is possible to resurrect early-era hardened rubber tyres. If you look at the original tyre manufacturing specification from Meccano part drawings, Meccano favoured oil-extended rubber (to preserve the molds for long production runs). That means that it is mainly the oil that is leaching out that is causing hardening (oxygen damage is another attack). This remedy works on tyres that are hard, but do not have extensive surface degeneration. 1/3 Xylene and 2/3 oil of wintergreen (by volume). Soak tyre for 24 to 48h (or any other type of hardened rubber product). Remove and allow Xylene to gas off. One of two things happens when soaking: either the tyre (or most of the surface detail) dissolves (too far gone), or the tyre returns to a reasonably soft, rubbery state (and stays that way). 50/50 success by test so far (I've mainly tried old, black Dunlop tyres so far). Some guys boil the tyres with OOW and water. Others use 25% rubbing alcohol, 75% OOW. Tyres will forevermore smell of eucalyptus-mint (Methyl Salicylate). These are relatively dangerous chemicals - handle at you own risk. Peter, The 142j tyre was available during 2004-2009 in the following sets:- 1524, 2715, 2725, 2371, 5700, 0524, 0532, 0546, 3702 & 3703. Where does the Aero tyre 142j that fits the 1/2 inch pulley come from. Also French tyres "PNEU HUTCHINSON" and other side "FAB EN FRANCE MECCANO 142A" for 2 inches and " 142 B " for tyres 3 inches. One of the problem with the Dunlop tyres is the inevitable hardening that happens over time. This can be retarded by storing tyres (and for that matter drive bands) in sealed bags, preferably in the freezer, when not in use. Temperature and oxygen reduce the lifespan of tyres and a set of 142b originals or repros isn't cheap.